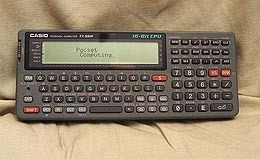 The PB-700 features the first 4 lines display in the world of BASIC pocket computers. - Brought lots of people to computers!! RAM : ?? ROM : ?? Graphic display : ?? Text display : ?? BASIC, C, Assembly and CASM programming language.